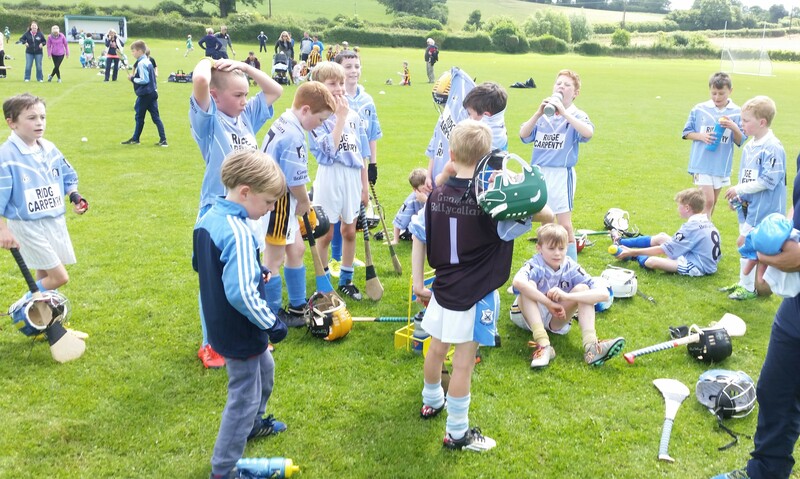 Graigue Ballycallan U10s hosted a mini blitz in Kilmanagh on Saturday 2nd July with Ballyhale, Tullaroan and Freshford taking part. Graigue Ballycallan were worthy winners of all three matches on the day, and a huge effort was put in by all to achieve the three-in-a-row. 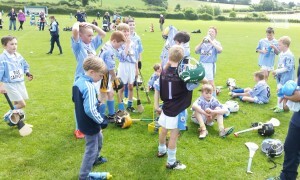 Our first match was against Ballyhale and we fielded a strong team in order to get the best possible start to the day. The team grew in confidence after this win and spirits were high heading into our last two games. Final score ended at GBC 3-3 to Ballyhale 2-1 with our top scorers, Ben Young, Elliot Teehan and Paidi Egan continuing to deliver and lead the way. However, there was also great determination and effort put in by Sean McGrath, Eoghan Cahill, Tony Butler and Frank McCluskey who put in his best performance to date. For our second game against Tullaroan, some positional changes ensured more lads had an opportunity to play and again Graigue Ballycallan ran out comfortable winners with a score of 5-1 to Tulloroan 3-3. Confidence was growing throughout the team as the game progressed and players were hurling more freely and winning possession. Two lovely ‘on the ground’ hurling goals from Donnacha Cleere and JJ Maher helped to seal the deal against our old rivals. Our last games was against Freshford and after our two previous tough matches, tiredness was setting in but GBC won by a slim margin with a score line of 2-3 to Freshford 1-3. Full credit to Aidan Comerford, Robbie Tector, Chris Mahony and Cillian Hoyne who soldiered bravely all morning and gave it their all. The team were as follows; Shane Cody, Ben Young, Aidan Comerford, Donnacha Cleere, Sean McGrath, Cillian Hoyne, Elliot Teehan, Frank McCluskey, Paidi Egan, Eoghan Cahill, Robbie Tector, James O’Halloran, Tony Butler, Chris Mahony, JJ Maher and Robbie Lynch. It was a great morning’s hurling and hopefully our success on Saturday will ensure many more victories in the summer ahead. Our thanks to Maurice Ronan who, as usual, had the pitch in mint condition. We couldn’t help but notice a star performer on the Tullaroan Team – Cillian Brennan, who is a class mate of some of our players. Well done Cillian, we might work on him to transfer to Kilmanagh! IMPORTANT: Please note that all injuries to GBC players while training or playing for the club must be notified to Martin Prendiville Mobile: 0873779658 or email martinprendiville@gmail.com within 7 days of the incident. Parents of underage players must send the notification. Following a recent meeting of Kilkenny County Board, all clubs in Kilkenny were instructed to advise their members that due to Health and Safety concerns, all dogs(with the exception of Guide Dogs) are prohibited, at all times from entering GAA Grounds. As a result of this directive, we would like to draw your attention to the recently erected signs at Tom Ryall Park, Kilmanagh notifying patrons of this policy. We would appreciate your support in this matter.